Description: This is a set of riding vehicles for Little People. The early versions of these vehicles had "Made In USA" imprinted on the underside of them. This imprint was soon removed, much like the "F-P TOYS" imprint that was on early versions of Little People car wheels. The little riders that have "Made In USA" imprint on them are much harder to find than those that do not. Beware of the Little Riders vehicle imposters manufactured by Illco. These vehicles are shameless copies of Fisher-Price Little Rider vehicles, including the plane, the train, and the tricycle. The problem with the Illco vehicles is that the Fisher-Price Little People figures fit rather tightly into the seats, opposed to the smooth comfortable fit of the Fisher-Price vehicles. Accessories: This set includes five riding vehicles that come in four possible colors (red, orange, blue and green). As a set, the horse and plane are the same color; the trike and train are the same color; and the wagon is one of the 2 colors left. However, the 1989 dealer catalog shows a blue plane and horse, a red trike, orange wagon, and a green train, so the rule apparently does not always apply. EUPP - Boy - Yellow body, red ball cap facing forward, smiling, freckles, "" eyebrows. GMPP - Girl - Dark red body, blonde bob with bangs, smiling. ETPP - Boy - Yellow body, red ball cap facing forward, smiling. GLPP - Girl - Dark red body, brown sculpted bob. *See Variations below. GEPP - 1983-1990's red body girl with a brown sculpted bob has also been seen with a light red body opposed to dark red. FPT588 - Blue top, white bottom airplane. Marked "F-P TOYS" and "MADE IN U.S.A." on the bottom. FPT818 - Blue top, white bottom airplane. Marked "F-P TOYS" and "MADE IN U.S.A." on the bottom, but factory scratched off "MADE IN U.S.A." when produced outside the US. FPT817 - Blue top, white bottom airplane. Marked "F-P TOYS" on the bottom. FPT22225 - Blue top, white bottom airplane. Has no mark on the bottom. FPT589 - Green top, white bottom airplane. Marked "F-P TOYS" and "MADE IN U.S.A." on the bottom. FPT820 - Green top, white bottom airplane. Marked "F-P TOYS" and "MADE IN U.S.A." on the bottom, but factory scratched off "MADE IN U.S.A." when produced outside the US. FPT819 - Green top, white bottom airplane. Marked "F-P TOYS" on the bottom. FPT22226 - Green top, white bottom airplane. Has no mark on the bottom. FPT587 - Orange top, white bottom airplane. Marked "F-P TOYS" and "MADE IN U.S.A." on the bottom. FPT822 - Orange top, white bottom airplane. Marked "F-P TOYS" and "MADE IN U.S.A." on the bottom, but factory scratched off "MADE IN U.S.A." when produced outside the US. FPT821 - Orange top, white bottom airplane. Marked "F-P TOYS" on the bottom. FPT22224 - Orange top, white bottom airplane. Has no mark on the bottom. FPT586 - Red top, white bottom airplane. Marked "F-P TOYS" and "MADE IN U.S.A." on the bottom. FPT824 - Red top, white bottom airplane. Marked "F-P TOYS" and "MADE IN U.S.A." on the bottom, but factory scratched off "MADE IN U.S.A." when produced outside the US. FPT823 - Red top, white bottom airplane. Marked "F-P TOYS" on the bottom. FPT22223 - Red top, white bottom airplane. Has no mark on the bottom. FPT685 - Riding horse with a blue mane, seat, and sides. Marked "F-P TOYS" and "MADE IN U.S.A." on the bottom. FPT843 - Riding horse with a blue mane, seat, and sides. Marked "F-P TOYS" and "MADE IN U.S.A." on the bottom, but factory scratched off "MADE IN U.S.A." when produced outside the US. FPT842 - Riding horse with a blue mane, seat, and sides. Marked "F-P TOYS" on the bottom. FPT22229 - Riding horse with a blue mane, seat, and sides. Has no mark on the bottom. FPT686 - Riding horse with a green mane, seat, and sides. Marked "F-P TOYS" and "MADE IN U.S.A." on the bottom. FPT845 - Riding horse with a green mane, seat, and sides. Marked "F-P TOYS" and "MADE IN U.S.A." on the bottom, but factory scratched off "MADE IN U.S.A." when produced outside the US. FPT844 - Riding horse with a green mane, seat, and sides. Marked "F-P TOYS" on the bottom. FPT22230 - Riding horse with a green mane, seat, and sides. Has no mark on the bottom. FPT684 - Riding horse with a orange mane, seat, and sides. Marked "F-P TOYS" and "MADE IN U.S.A." on the bottom. FPT847 - Riding horse with a orange mane, seat, and sides. Marked "F-P TOYS" and "MADE IN U.S.A." on the bottom, but factory scratched off "MADE IN U.S.A." when produced outside the US. FPT846 - Riding horse with an orange mane, seat, and sides. Marked "F-P TOYS" on the bottom. FPT22228 - Riding horse with a orange mane, seat, and sides. Has no mark on the bottom. FPT683 - Riding horse with a red mane, seat, and sides. Marked "F-P TOYS" and "MADE IN U.S.A." on the bottom. FPT849 - Riding horse with a red mane, seat, and sides. Marked "F-P TOYS" and "MADE IN U.S.A." on the bottom, but factory scratched off "MADE IN U.S.A." when produced outside the US. FPT848 - Riding horse with a red mane, seat, and sides. Marked "F-P TOYS" on the bottom. FPT22227 - Riding horse with a red mane, seat, and sides. Has no mark on the bottom. FPT597 - Blue tricycle. Marked "F-P TOYS" and "MADE IN U.S.A." on the bottom. FPT832 - Blue tricycle. Marked "F-P TOYS" and "MADE IN U.S.A." on the bottom, but factory scratched off "MADE IN U.S.A." when produced outside the US. FPT831 - Blue tricycle. Marked "F-P TOYS" on the bottom. FPT22232 - Blue tricycle. Has no mark on the bottom. FPT596 - Green tricycle. Marked "F-P TOYS" and "MADE IN U.S.A." on the bottom. FPT834 - Green tricycle. Marked "F-P TOYS" and "MADE IN U.S.A." on the bottom, but factory scratched off "MADE IN U.S.A." when produced outside the US. FPT833 - Green tricycle. Marked "F-P TOYS" on the bottom. FPT22233 - Green tricycle. Has no mark on the bottom. FPT595 - Orange tricycle. Marked "F-P TOYS" and "MADE IN U.S.A." on the bottom. FPT836 - Orange tricycle. Marked "F-P TOYS" and "MADE IN U.S.A." on the bottom, but factory scratched off "MADE IN U.S.A." when produced outside the US. FPT835 - Orange tricycle. Marked "F-P TOYS" on the bottom. FPT22234 - Orange tricycle. Has no mark on the bottom. FPT594 - Red tricycle. Marked "F-P TOYS" and "MADE IN U.S.A." on the bottom. FPT838 - Red tricycle. Marked "F-P TOYS" and "MADE IN U.S.A." on the bottom, but factory scratched off "MADE IN U.S.A." when produced outside the US. FPT837 - Red tricycle. Marked "F-P TOYS" on the bottom. FPT22231 - Red tricycle. Has no mark on the bottom. FPT734 - Blue wagon. Marked "F-P TOYS" and "MADE IN U.S.A." on the bottom. FPT735 - Blue wagon. Marked "F-P TOYS" and "MADE IN U.S.A." on the bottom, but factory scratched off "MADE IN U.S.A." when produced outside the US. FPT736 - Blue wagon. Marked "F-P TOYS" on the bottom. FPT22237 - Blue wagon. Has no mark on the bottom. FPT737 - Green wagon. Marked "F-P TOYS" and "MADE IN U.S.A." on the bottom. FPT738 - Green wagon. Marked "F-P TOYS" and "MADE IN U.S.A." on the bottom, but factory scratched off "MADE IN U.S.A." when produced outside the US. FPT22238 - Green wagon. Has no mark on the bottom. FPT740 - Orange wagon. Marked "F-P TOYS" and "MADE IN U.S.A." on the bottom. FPT741 - Orange wagon. Marked "F-P TOYS" and "MADE IN U.S.A." on the bottom, but factory scratched off "MADE IN U.S.A." when produced outside the US. FPT742 - Orange wagon. Marked "F-P TOYS" on the bottom. FPT22236 - Orange wagon. Has no mark on the bottom. FPT743 - Red wagon. Marked "F-P TOYS" and "MADE IN U.S.A." on the bottom. FPT744 - Red wagon. Marked "F-P TOYS" and "MADE IN U.S.A." on the bottom, but factory scratched off "MADE IN U.S.A." when produced outside the US. FPT745 - Red wagon. Marked "F-P TOYS" on the bottom. FPT22235 - Red wagon. Has no mark on the bottom. FPT689 - Blue train. Marked "F-P TOYS" and "MADE IN U.S.A." on the bottom. FPT851 - Blue train. Marked "F-P TOYS" and "MADE IN U.S.A." on the bottom, but factory scratched off "MADE IN U.S.A." when produced outside the US. FPT850 - Blue train. Marked "F-P TOYS" on the bottom. FPT22241 - Blue train. Has no mark on the bottom. FPT690 - Green train. Marked "F-P TOYS" and "MADE IN U.S.A." on the bottom. FPT853 - Green train. 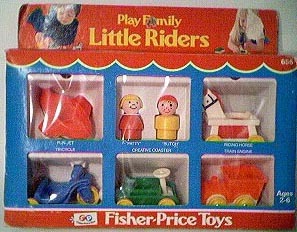 Marked "F-P TOYS" and "MADE IN U.S.A." on the bottom, but factory scratched off "MADE IN U.S.A." when produced outside the US. FPT852 - Green train. Marked "F-P TOYS" on the bottom. FPT22242 - Green train. Has no mark on the bottom. FPT688 - Orange train. Marked "F-P TOYS" and "MADE IN U.S.A." on the bottom. FPT855 - Orange train. Marked "F-P TOYS" and "MADE IN U.S.A." on the bottom, but factory scratched off "MADE IN U.S.A." when produced outside the US. FPT854 - Orange train. Marked "F-P TOYS" on the bottom. FPT22240 - Orange train. Has no mark on the bottom. FPT687 - Red train. Marked "F-P TOYS" and "MADE IN U.S.A." on the bottom. FPT857 - Red train. Marked "F-P TOYS" and "MADE IN U.S.A." on the bottom, but factory scratched off "MADE IN U.S.A." when produced outside the US. FPT856 - Red train. Marked "F-P TOYS" on the bottom. FPT22239 - Red train. Has no mark on the bottom. 1985-1986 - This set was sold in a 11-13/16" long, 7-1/8" high, 2-1/8" deep display box. 1987-1990 - This set was sold in a 11-13/16" long, 8-5/8" high, 2-1/8" deep display box.